At the program outset, he had mixed dominance problems. He was right-foot, right-eye and right-hand dominant, but he had mixed-ear dominance. Happily he is right-ear dominant now, bring all dominance into the “right” category. This greatly increases his efficiency at various tasks. At the beginning, Big B manifested all seven primitive reflexes to varying degrees. Over the course of his four months at the center, all seven were drastically diminished, and nearly eliminated. Continuous home exercise work should eliminate them completely within a few months. We are very proud of our 7-year-old guy. At the outset, Big B exhibited undersensitivity in the realm of touch. This had caused a number of difficulties, including an inability to recognize when he was full after eating. So he became a chronic overeater, receiving no “I’m full” signals from his body. So we were very happy to see that in arm and leg touch sensation, he progressed from a 4-year-old level in both areas, to respectively a 6- and 5-year old level of touch sensitivity.+1-2 years. He is still delayed in fine motor skills, but he advanced from 2-year-old level to that of a 4-year-old. +2 years. At the same time, in terms of his balance and equilibrium system maturity, he progressed from a level 2 out of 15 to a 12!! +10 levels! And in his core muscle development, he went from having the core muscle strength of a 3-year-old to that of a 6-year-old, in three groups. In the the other three groups, he went from an age 3 to a 5. +3 years, and +2 years!! At the beginning of the Brain Balance program, Big B was still struggling to stand on one foot long enough to put his pants on. Indeed, he always needed assistance from a parent to do so. He could not balance on one foot, period. But now he can. This was an early change which I saw immediately, and which gave me great relief! In proprioception, he went from having the spatial awareness of a 3-year-old to that of a 5-year-old. +2 years. In bi-lateral movements, balance and equilibrium, B moved from an age 3 to a 6. +3 years. In his gait and aerobics, he went from a 2-year-old level up to a 5. Also +3 years. And on the interactive metronome, he went from a 4-year-old level to that of a 5-year-old. +1 year. And last but not least, on the Brown’s Scale of ADHD Symptoms, we noted a significant overall change! At the outset, his ADHD behaviors were pronounced, and his scores reflected that with frequencies of each in the upper-70’s, out of a 100. By the end of the program, all of the target behaviors were down into the the mid-40’s, with a couple in the 50’s. This reduction of symptoms is miraculous to me, and wholly attributable to Big B’s hard work at the Brain Balance center. We couldn’t be more thrilled! And we haven’t even talked about the diet portion of the program. Let me say that following the diet guidelines was also huge for Big B’s health,as it was for mine, and for his dad’s, and for his siblings. To any parents reading this, and wondering if it is worth all the sacrifice and trouble, let me re-emphasize: IT IS!! Big B lost much of the extra weight that he’d been carrying around for some time. We recently took him to the pediatrician for his yearly check-up. The change in B’s BMI score, and weight in relation to others his age,did not go unnoticed by Dr. Strong. 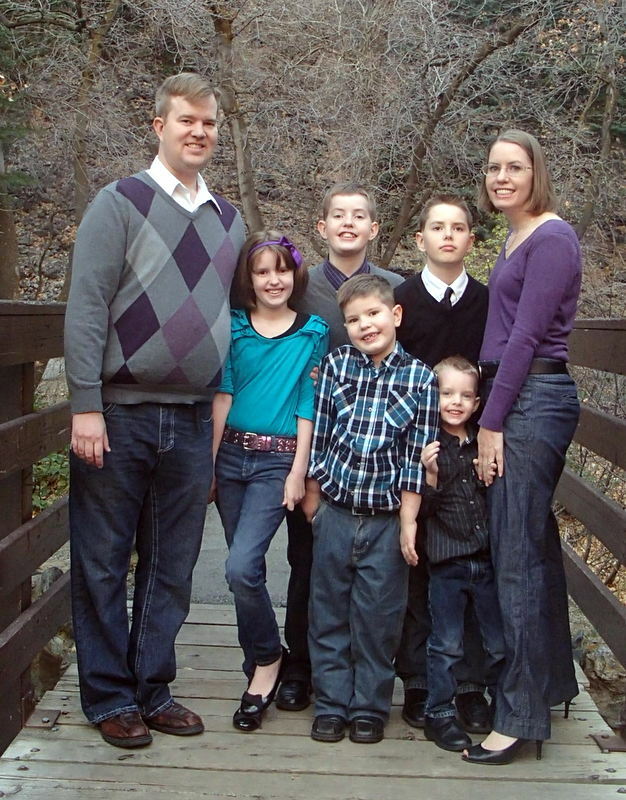 In fact, we took four of our five kids to him for their check-ups all within a two-week timeframe. And the same trend was present in Freckles (12) and Sparkle (10). They hadn’t been seriously overweight before, but did carry a little extra girth around the middle. 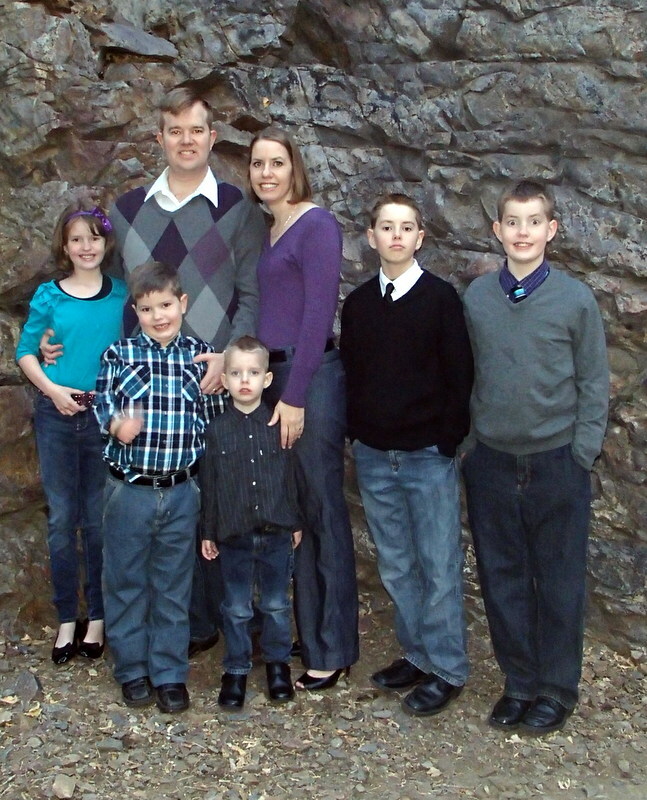 The Brain Balance diet changes helped all of our kids get healthier, and their doctor couldn’t be more pleased. Portrait in November, just before B finished his program. We are so proud of him!! I’ve been meaning to do a write-up of Dash’s final assessment. 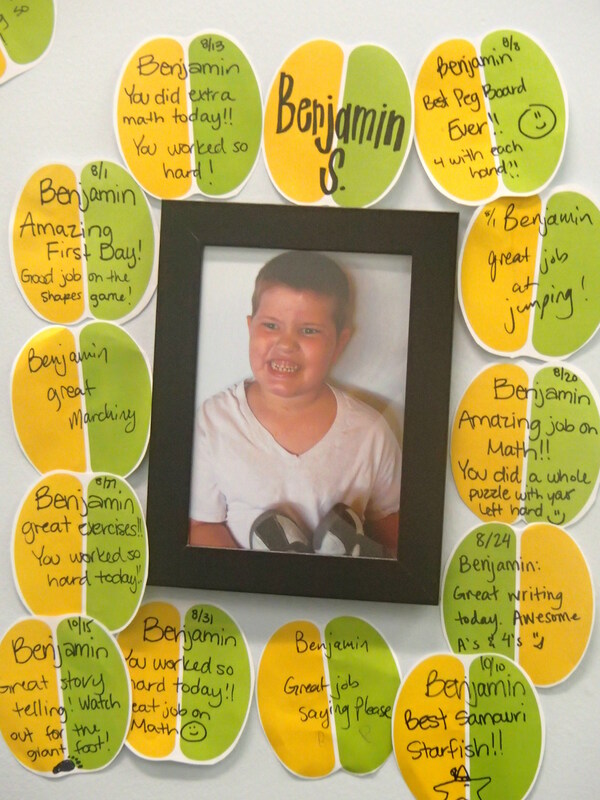 We are so proud of his hard work! His re-assessment reflects great progress. Though he could benefit from more sessions at the Brain Balance center, we are moving forward without them. If we had lots of money, we would keep him in, and probably enroll another couple of kids too! We will continue to do home exercises, and feel confident that he will soon be able to eliminate any lingering primitive reflexes. Of the eight primitive reflexes which were all present at his first assessment, he has eliminated one. On three others, there has been no change. He manifests those reflexes at the same level he did upon beginning, both of which he did not strongly manifest from the start. The other four are almost eliminated, but still hanging on. A few more months of dedicated home programming exercises will eliminate them completely. In all vision tests he has improved, and now instead of 18 sets of eye exercises per week, he can go down to 2-3 sets per week. There is a lot of technical language that goes into the individual eye tests, which would be too complicated to summarize. So I will just leave it at that. His eyes are much better now! He is tracking more smoothly through the pages in his reading, and his comprehension, which initially was at 60%, is now at 90%. Obviously this means great things for his current and future academic abilities. His auditory perception at the outset was already at the level of a 15-year-old when he began the program, and he retains that level today. 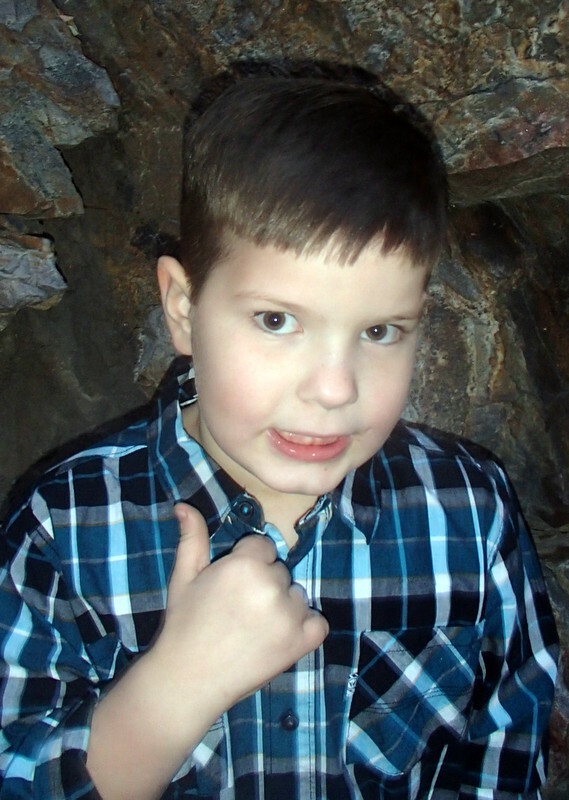 In auditory processing, he advanced one year, putting him now at the level of an 11-year-old. Still lagging slightly, but not as much as before. In touch sensation, he advanced two years, from that of a 7-year-old to that of a 9-year-old. 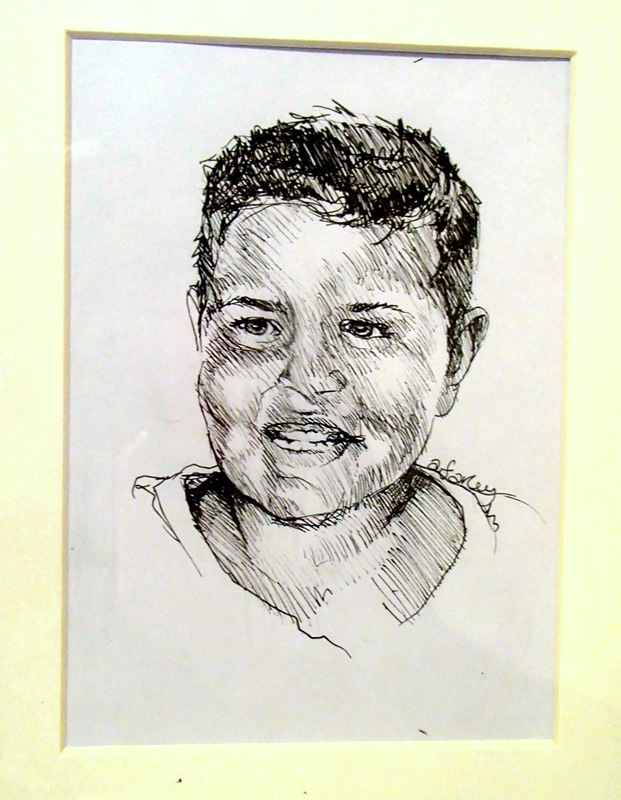 In fine motor development, he made great strides, going from an initial 7-year-old level, now to that of a 15-year-old. Eight years, in just three months! He moved up in the maturity level of his balance and equilibrium by one level, from a level 13 now up to a 14, 15 being the highest level measured. Out of the six core muscle groups, his core strength improved in four out of six areas, remaining the same in brachiation (holding himself in a chin-up position) and sit-ups. In his supine core he went from age 6 to 10. In Prone core, he went from age 7 to 13. In lateral core, he went from age 8 to 11. And in push-ups, he went from age 4 to 9. He advanced 5 years in proprioception/spatial awareness, having started at a 6-year-old level, and advancing to that of an 11-year-old. In synchronization skills, he made great improvements in all three areas. 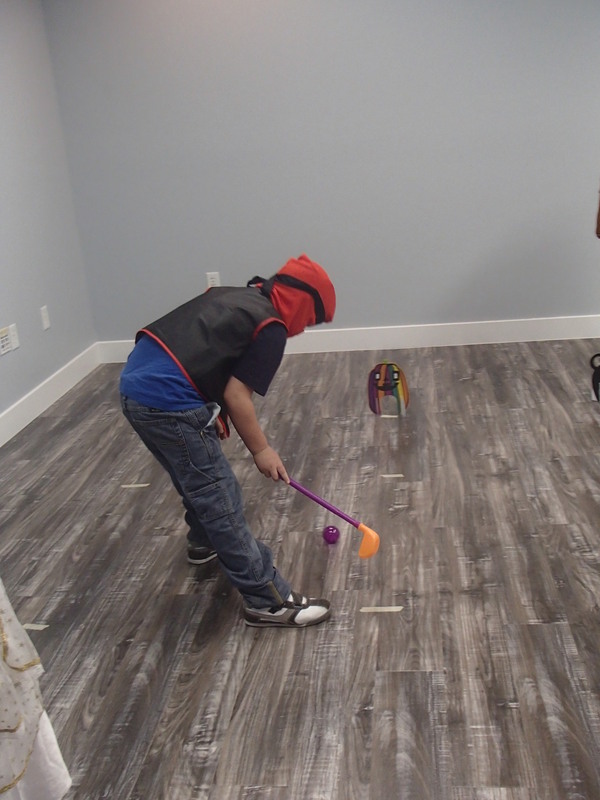 His ability to process rhythm, timing and motor planning, he advanced 5 years, going from his initial 5-year-old level, to now functioning at a 10-year-old level. He surpassed his goals in gait and aerobics. 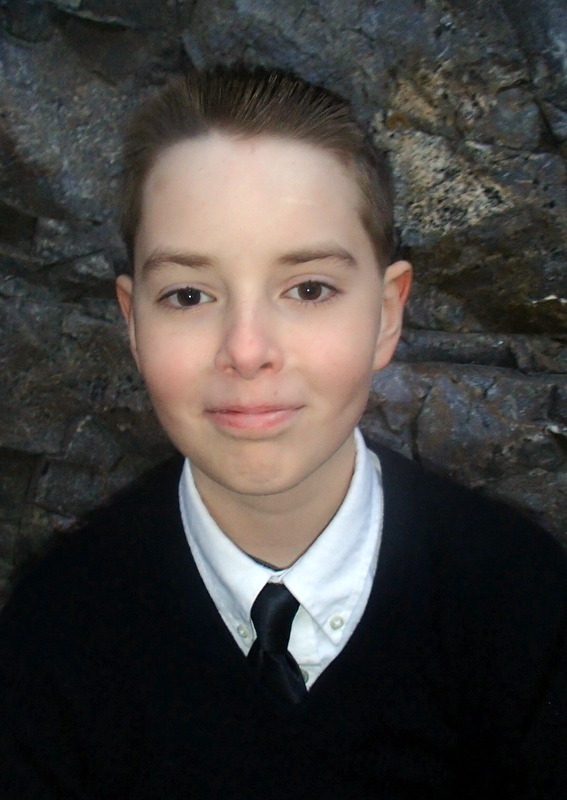 Having started out at the level of a 5-year-old, he now functions at the level of a 14-year-old (9 years advancement!). 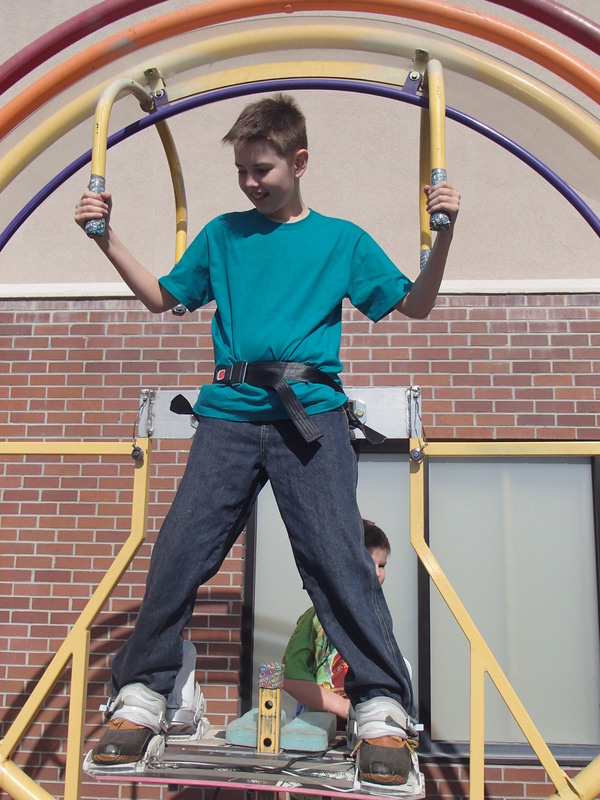 And finally, in his overall balance/bilateral movements and equilibrium, he has also advanced 9 years going from a functional 8-year-old to a 17-year-old functioning level! While there is clearly room for improvement, Dash has worked hard and made great progress, and we are so happy for him. Another profound discovery we made, is that he is exhibiting a lot less ADHD behaviors than he did three months ago. 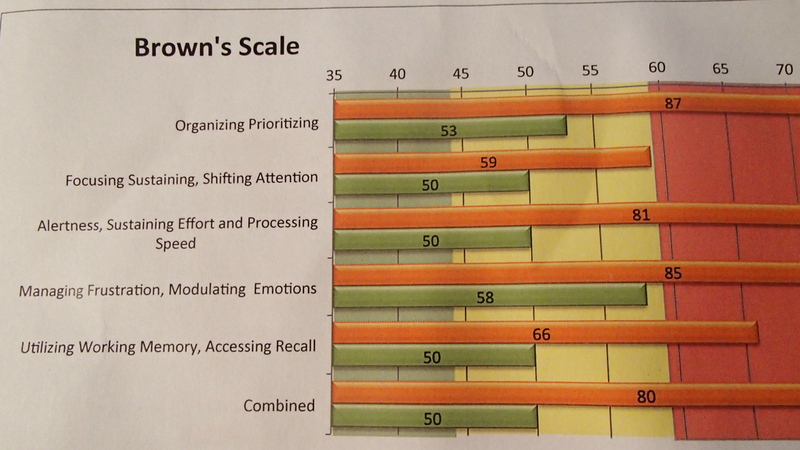 At the initial and the final assessments, we filled out a Brown’s Scale survey, which assesses executive function impairments, associated with ADD/ADHD and related problems. As you can see from his current assessment (below), Dash has seen a great deal of improvement across the board, to the extent that I believe his ADHD symptoms are virtually gone. This is amazing to me, and this fact alone makes the entire program so worth it. Brown Scale goal is to have all scores fall into the green, meaning there is a lower incidence of counter-productive behaviors present. 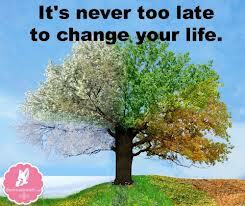 And don’t get me started again on how much the diet changes have impacted me personally, and all of our family members! My early blog entries represent this thoroughly. Even if all we accomplished here was the establishment of better lifelong eating habits, and a long-term increase in our family physical activity levels, it would be the best money I ever spent. But Brain Balance has done so much more, and I’m just so thankful for that. 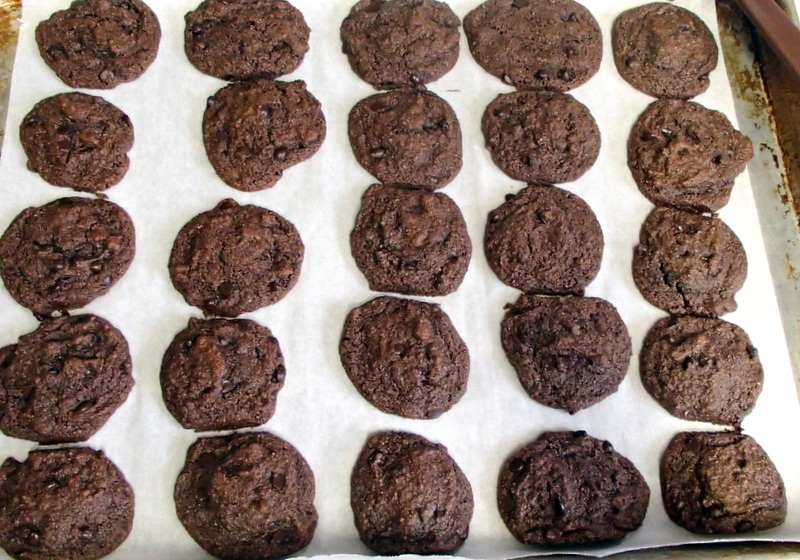 My latest adaptation of our favorite diet-friendly cookie. Preheat oven to 350 degrees Fahrenheit. Mix all ingredients together in a small mixing bowl, except for chocolate chips. When all dough is mixed and coconut oil cooled down, add in chocolate chips. Line jelly roll baking sheet with parchment paper. Use small ice cream scoop to drop cookie balls onto pan, I usually do a grid of 5X6 balls per pan. Flatten cookie balls with palm of hand or spoon, because they won’t spread much on their own during baking. Cook for 6-8 minutes on 350. Let cool for fifteen minutes, and enjoy! Makes approximately 30 cookies. 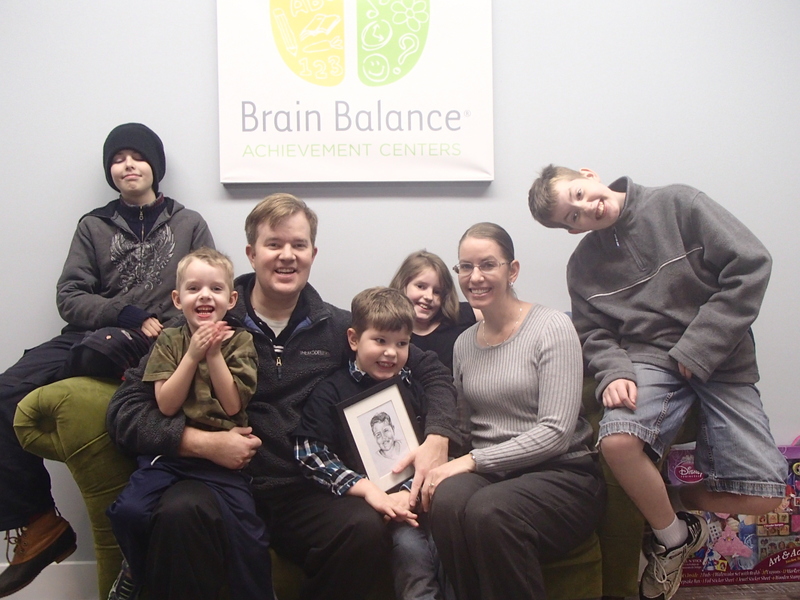 We all attended Dash’s Brain Balance Graduation ceremony this week. 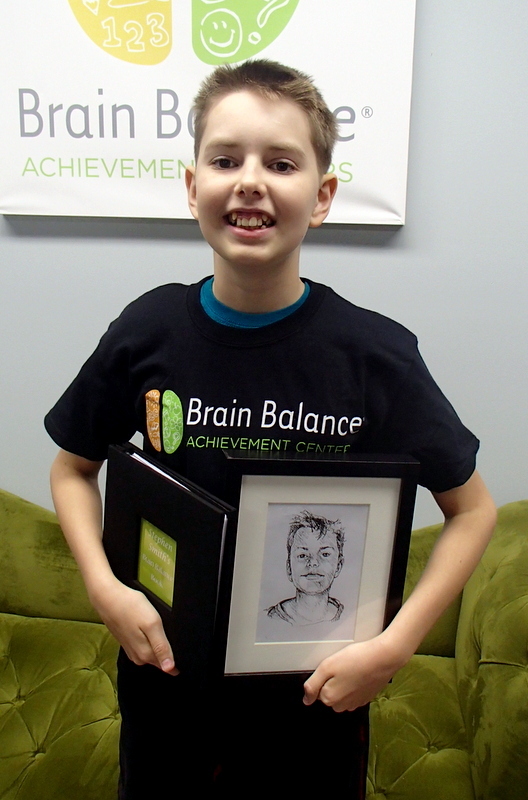 They gave him a Brain Balance T-shirt (which he is still wearing, two days later! ), a memory book with all of the brains from his achievement wall, and personal notes from staff members written inside. And see the beautiful sketch that Annie made below! She has talent! 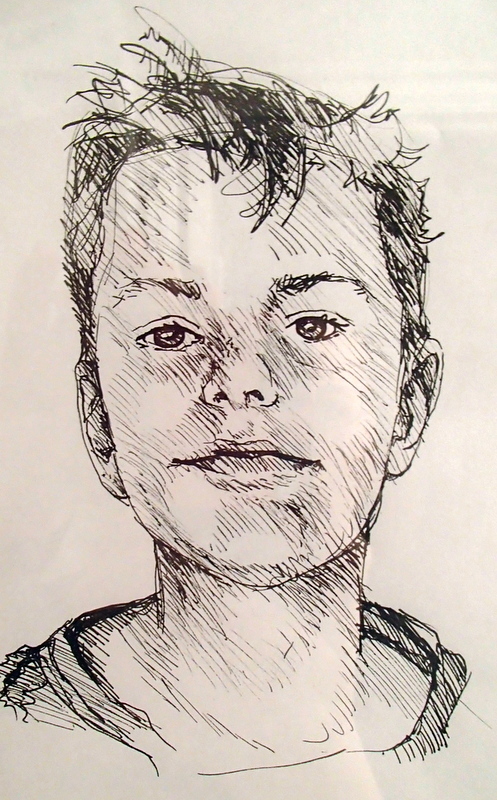 A beautiful sketch of Dash, by artist and BB staff member Annie. Thank you so much Annie, we love it!! A candy-less Halloween can be fabulous! Friends, if you are still following our blog, thank you. I hope it has been helpful for someone. I am behind again! 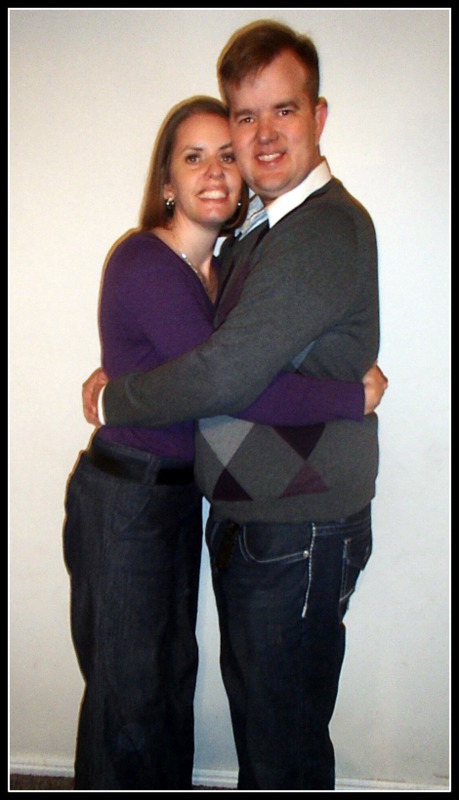 Here is a quick post on what we did for Halloween. Stay tuned for a post with Dash’s final assessment results. 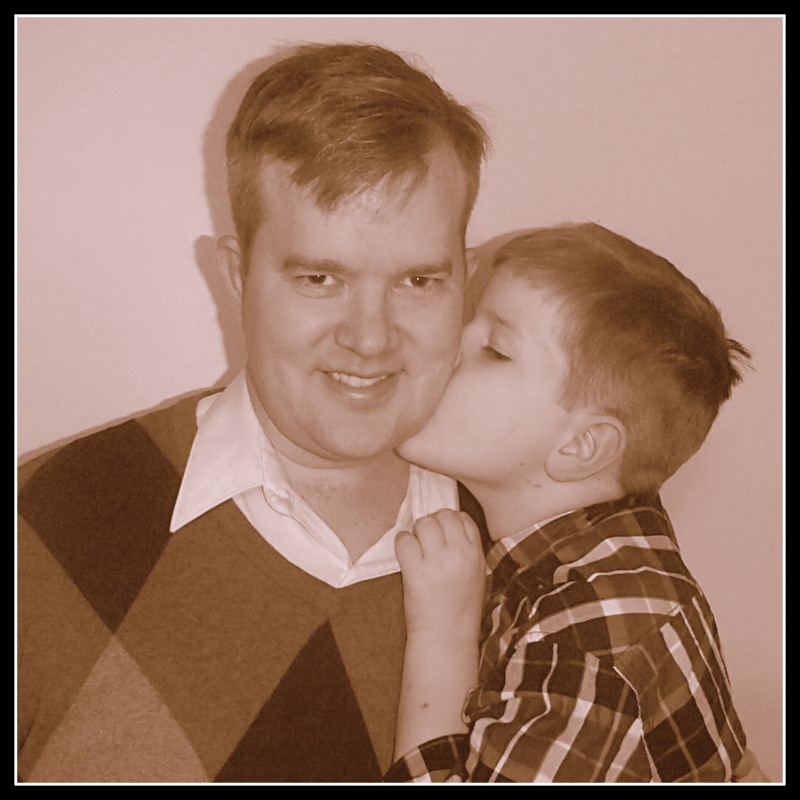 And here is a set of family photos, which I love. It reminds me that good health springs forth from a healthy relationship with food. I think all of us have achieved a healthier weight this year. The trend continues, with the exception of Baby Blues, whom we are encouraging to consume larger quantities of good calories. He has always been on the underweight end of the spectrum. So has Dash, for that matter. We had talked with our kids at the beginning of October about making Halloween candy an incentive for getting all of their home program exercises done each day. Here is what we decided. The kids and I did alright with the exercises this last month, but we still didn’t manage to get them ALL in, as we were hoping to. As the end of this month drew closer, we had to make a decision about how we would celebrate Halloween. After talking as a family, we decided that instead of trick-or-treating, we would buy some new Beyblades and a Beyblade stadium, and let the kids do a tournament. We also decided to have a party at home, with treats and food that fit in with our diet. It was great! Big B and all of the kids were super excited all week, and kept asking us when we would go pick up the Beyblades, and when they could play with them. So we finally bought them on the 30th, and told the kids that on Halloween morning they could open them up and start warming up for the evening tournament. At 1pm on Halloween day, they were still going strong. :) Twenty years ago if you had told me all five of my kids would sit around and basically watch spinning tops “battle” each other in a plastic arena for hours on end, INSTEAD of going trick-or-treating, I’d have thought you were crazy! Alas, it is true. Spinning tops decked out with sculpted metal and plastic parts can be endlessly entertaining. Give each top a name and a battle persona, and the kids are set! 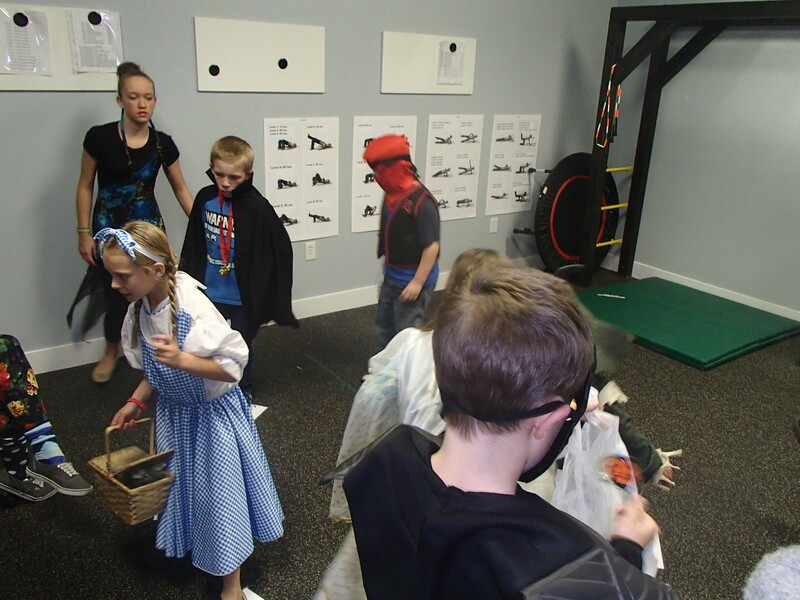 Another fun event from Halloween week was the Trick-or-Toy party at the Brain Balance center. Here are a few pics. 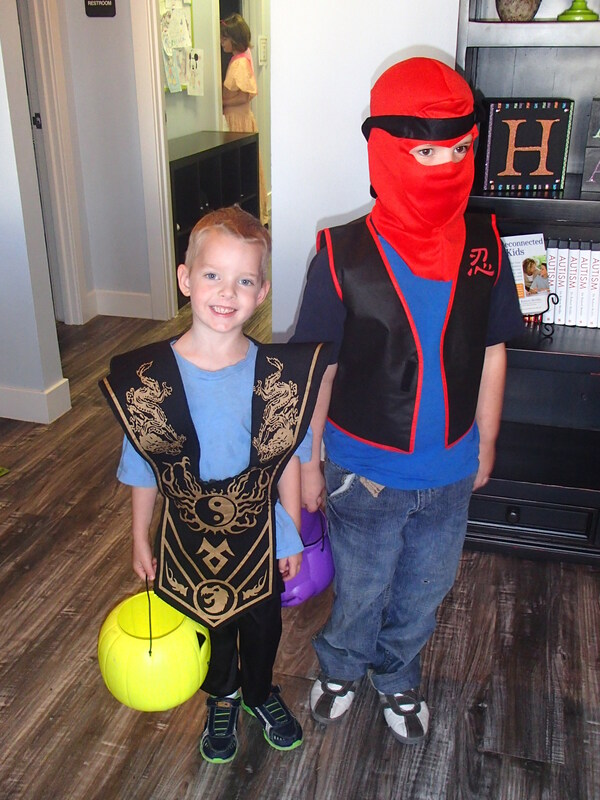 Baby Blues and Big B, a samurai and a ninja. Sparkle and Big B, honing their Badminton skills. 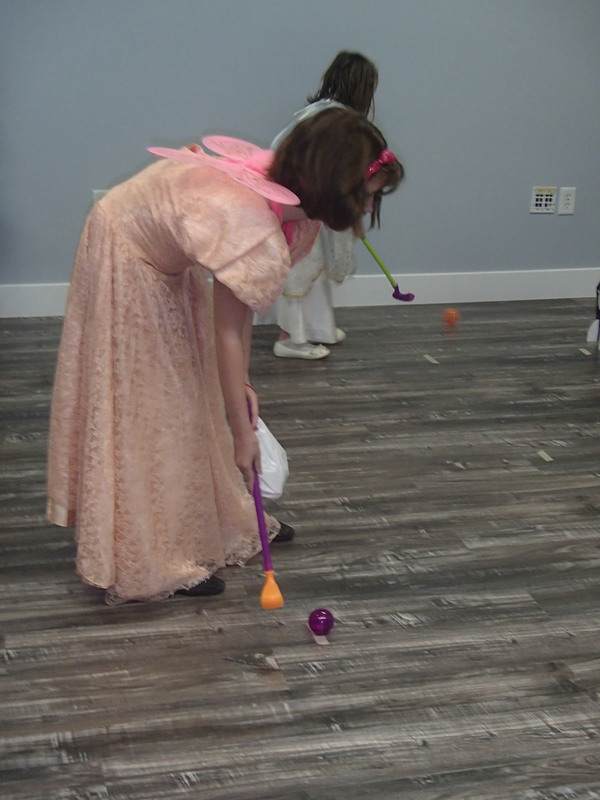 Using plastic golf clubs. 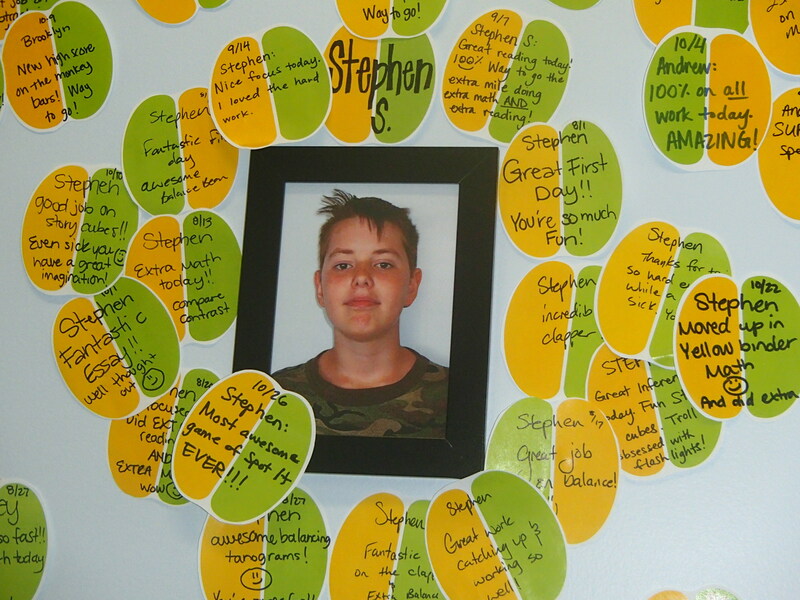 Big B’s Achievement Wall, also at the center. A few pics from our recent photo shoot. I misplaced my camera this month, for almost two weeks. If you know our family, you know that this is a long-standing problem. Though I must say, we have improved! Three or four cameras have fallen victim to our toddler-rich home environment (and the demonic fixation of at least two of my boys with flushing things down the toilet) in the last ten years. At least this time it was only misplaced, not deceased. And even if some pee wee tried to flush this one, we’d be ready. THIS camera is waterproof! So I didn’t get the Beyblade tournament on film, but that’s OK. Sometimes we forget that once upon a time (only 10-15 years ago), before “blogging” was even a word, we all survived just fine without photo-documentation of every single family event or significant milestone. Sometimes we have to chuckle at our image-obsessed digital age, you know? The point is, Halloween can be fabulous without candy, and even without pictures! 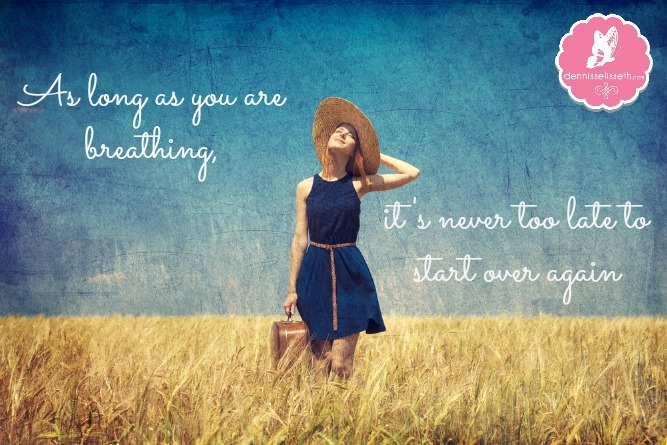 We have worked for many years now on creating a home that is healthy, and absent of dysfunction. It has taken a lot of time and effort, and much trial and error to figure out how to structure our home life in a way that pleases God and pleases us. We are working to overcome dysfunctional family generational processes. As we’ve moved through the years, charting our own course, I have seen the hand of God. We found for us that it is much simpler to make the big changes needed, when we aren’t tied down to someone else’s education agenda for our kids. Truly it is a daily struggle. We are still far from where we need to be. Nevertheless, I am certain that for now the most likely way for us to attain that healthier reality is to move forward on our present course. Brain Balance has moved us forward in an accelerated way, towards the kind of family we want to be, physically and otherwise. 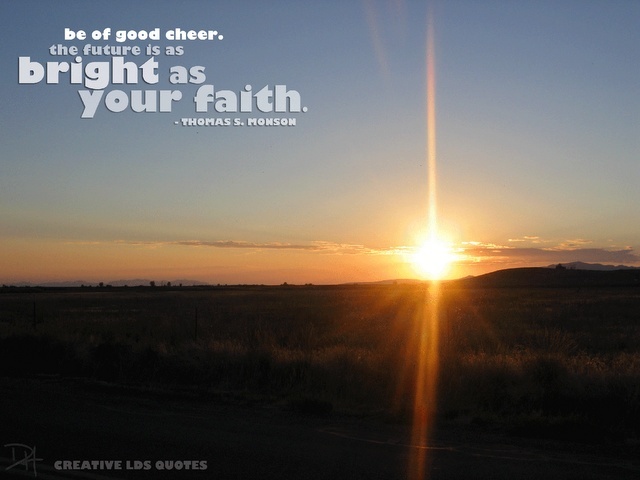 I am so thankful for the way it has helped us to increase our hope. Our kids’ futures have never looked brighter to me. I’ve mentioned before that we are homeschoolers. 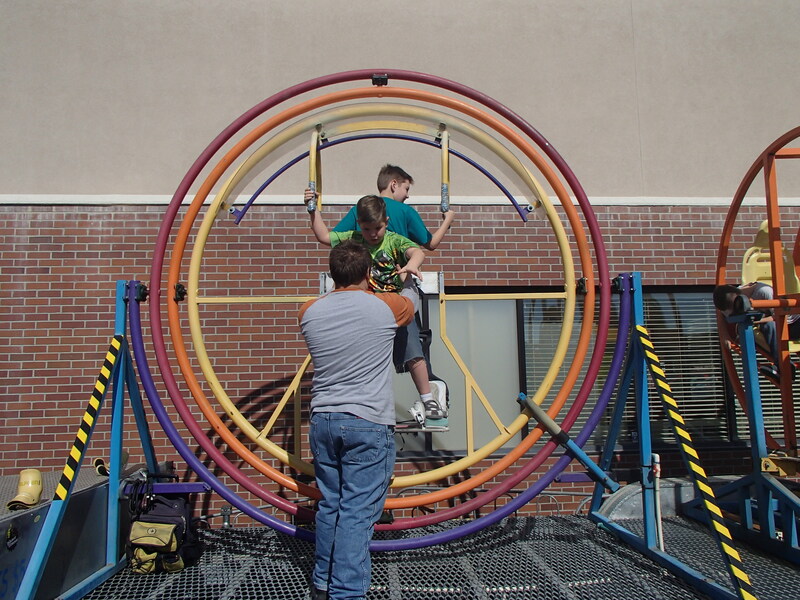 We decided that from August 1st through the end of the program, Brain Balance is our homeschool curriculum. That may seem unconventional or unwise to some of my readers. We subscribe to a number of holistic educational philosophies. We don’t replicate public school environments and learning modes in our home. 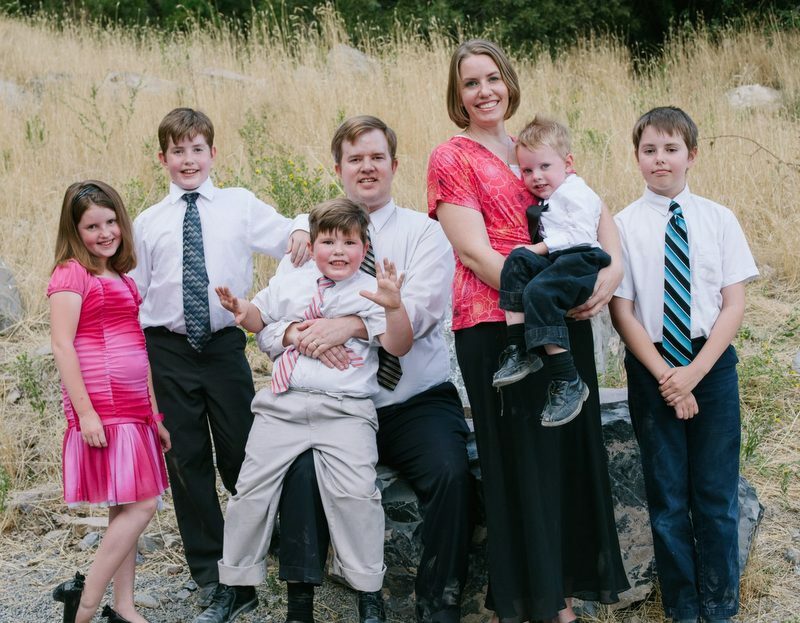 Utah Code gives homeschoolers a large amount of latitude to determine the specifics of how, when, and what they teach their kids, provided they are receiving instruction in the same subjects that the public schools teach. We are thankful for the way the codes are written, and are active in preserving the God-given right for everyone to oversee their child’s education. One question that comes up is “Why don’t you worry about whether or not your kids are ‘falling behind’ grade level in school subjects?” The answer to that is simple: there are many ways to teach a child in the designated subject areas, none of which prohibit allowing that child to proceed at his own pace. If you teach a child to love learning just for the sake of learning, they will quickly “catch up” with their peers when they are ready. Research has shown that homeschoolers tend to be at, or slightly behind their peers in the early elementary school age groups, but then jump ahead of many peers around the fifth or sixth grades. My only concern is that they are progressing at their own level, and not standing still. For us there exists a more important objective than academic parity with peers right now. 1. to develop the faculties and powers of (a person) by teaching, instruction, or schooling. Synonyms:instruct, school, drill, indoctrinate. 2. to qualify by instruction or training for a particular calling, practice, etc. ; train: to educate someone for law. 3. to provide schooling or training for; send to school. 4. to develop or train (the ear, taste, etc. ): to educate one’s palate to appreciate fine food. 5. to inform: to educate oneself about the best course of action. 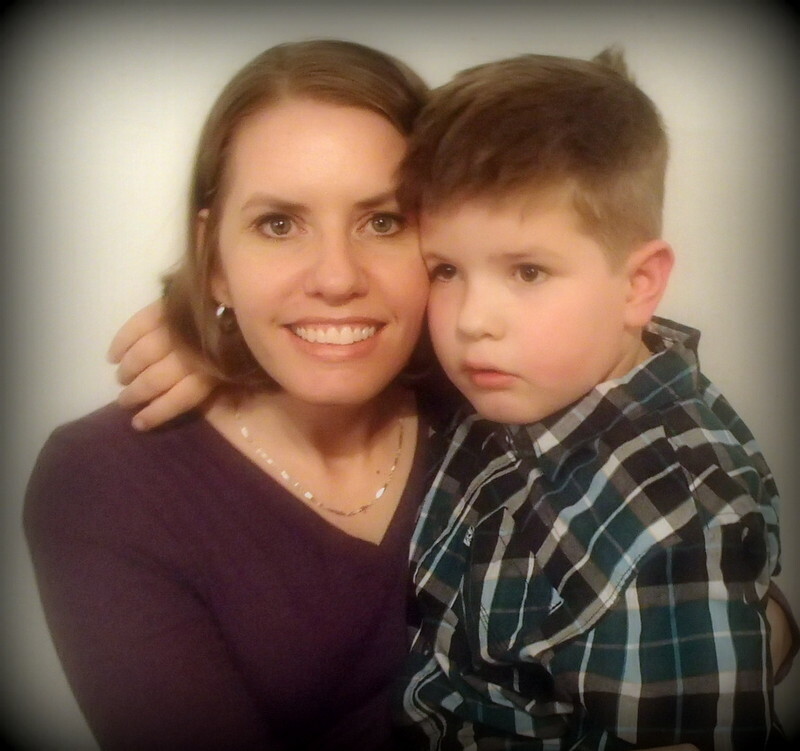 With Dash nearing the end of his three-month program at the Brain Balance Center, I have been reflecting on what we all have learned, and how he and the rest of us have changed for the better. His final assessment on his physical and academic skill levels, will happen later this week, so that report will be coming. What is not found in the progress reports from the center is a record of how he and his siblings have developed in other important areas over these last three months. This growth has been facilitated by the physical changes to our nutrition and environment, but aren’t limited to physical gains. I look at it as a boot camp of sorts, which has been preparing us with the ability to learn (in whatever individual courses are chosen) more effectively and efficiently in future. So here is a quick list of important things we have learned, and some of the good things we are seeing. These may seem random, but when taken as a whole, they paint a happy picture of progress for me. We’ve had our iPad since Big B was three. A couple of weeks ago he memorized my passcode for the first time ever, on the first time he watched me punch it in. Now I have to hide it from all of our kids. Dash blew up today at Big B, and was sent to his room. When he rejoined the family, he headed straight outside to mow his half of the lawn without being asked. Freckles mows the lawn super fast now, and does a great job with it. Big B sat quietly and attentively through the whole hour-long Sacrament Meeting a couple of weeks ago. First. Time. Ever. Freckles decided to pick up his Bible yesterday and read through the first ten chapters of Genesis in one sitting. A kid who *hates* reading. Sparkle, Freckles, and Dash have all learned how to create meals for the entire family that are in compliance with our strict diet. Favorites: egg salad lettuce wraps, waffles and breakfast sausage, scrambled eggs with honey lemon tea, honey lemon carrots, steamed broccoli, curry chicken and posho, homemade chili, Brazilian beans and rice, tuna salad on corn chips, sliced apples or pears from our trees with almond butter, carrot bisque, toasted pumpkin seeds. Baby Blues reminds us every day to do our exercises. Baby Blues looks at food labels and pretends to read and tells us whether something is gluten-free or not. All five kids took swimming lessons in the month of September and made huge strides in their progress. We have come to love creating meals together from raw, whole ingredients. Dash has read more classics in the last three months than he has in all of his previous years of life. Sparkle has seen great improvements in her ability to adopt new foods into her diet, including green salads. Another big first! Big B has started singing all of the songs he knows out loud, throughout the day. He remembers the lyrics really well, and has a great singing voice. This is a first for him. Sparkle, Dash and Freckles have all seen improvements since September in the balance, construction and neatness of their handwriting. 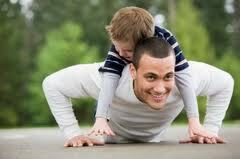 All of our children are developing healthier physiques and enjoy physical activity more than they did before. Dash just tonight picked up one of his airplane models that has been sitting in his closet. While he used to be overwhelmed with the undertaking, he completed the first model in just a few hours. Baby Blues and Big B have been absorbed for at least a couple of weeks now, with turning anything they can find into a “Beyblade.” The objects vary from kitchen measuring cups with lemons placed inside them, to halves of stacking balls turned up on ends, and from the glass finials of a curtain rod, to small food storage containers. We have come to enjoy washing our dishes together by hand as a family, since the dishwasher broke in August. All of the kids, — even Sparkle — agreed that instead of going trick-or-treating on Halloween, they wanted to do a Beyblade tournament party with our family, and then watch a Halloween movie, complete with City Cakes Bakery treats that fit within our diet. Hooray! All of the kids have consistently declined treats at scouting and church events, if they didn’t fit with our diet. Church members have approached us to ask us what they can do to provide treats that our kids can eat. Community support, double yay! Yay, we won a scholarship!! 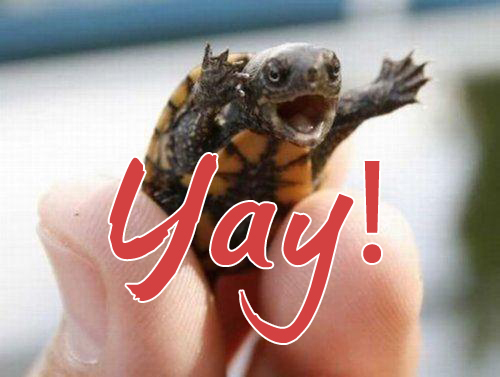 Dear friends, this is a very quick post to say YAY!!!! 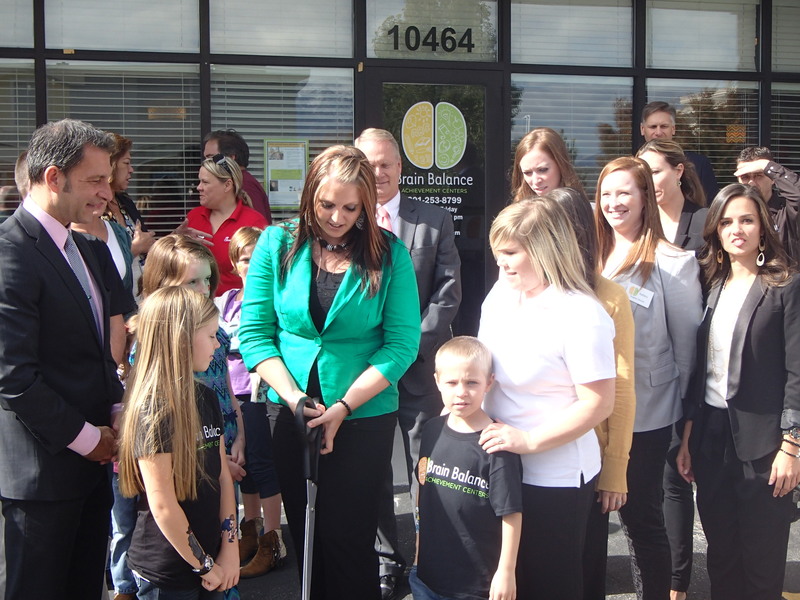 I put our name in the lottery for Brain Balance scholarships, at the Grand Opening events in South Jordan. Today I found out that we won the lottery for one of the two $1000 scholarships they gave away that day!!!! This is such a blessing, because we didn’t have funds to put Big B through another three months, even though he could benefit greatly by it. This allows for us to put him through another full month of the Brain Balance program, for a total of twelve more sessions. Double YAY!!! Today I had a short conversation with Dr. Robert Melillo, author of Disconnected Kids, Reconnected Kids, and Autism:The Scientific Truth About Preventing, Diagnosing and Treating Autistic Spectrum Disorders — and What Parents Can Do Now. I asked him how it all got started. A neurologist by profession, he had been working largely in rehab, and saw the benefits of applying a variety of interventions to help his patients. One obstacle to overcome in moving forward on his course of research was the fact that professionals from a variety of medical fields and therapeutic expertise are not generally inclined toward collaboration with others not of their stripe. 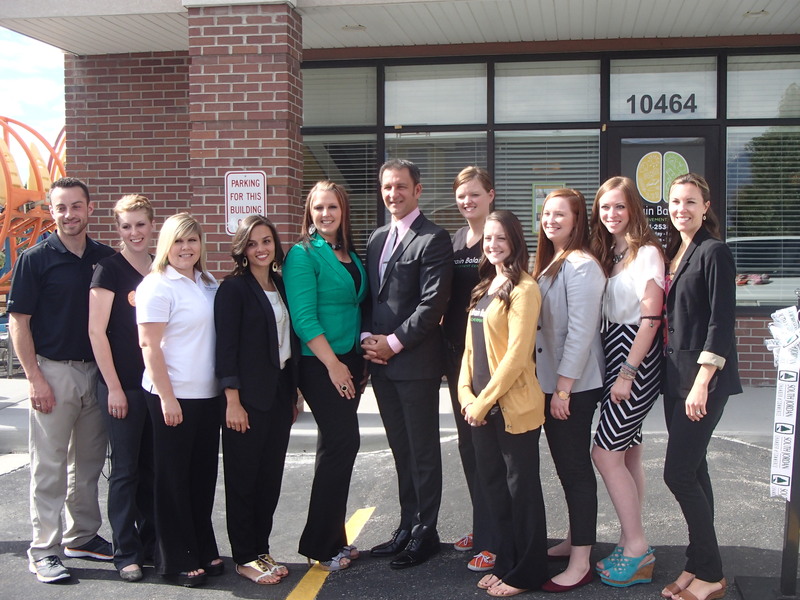 But Dr. Melillo knew that to succeed, he needed a team of people to come together, from all different fields. He was uniquely prepared to meet the challenge, by virtue of his depth of understanding across numerous professional disciplines. He knew as much about nutrition as the nutritionists he recruited. Likewise he knew as much about psychology, and physical and occupational therapy as those therapists did. He possessed the vernacular and understanding needed to reach across professional lines, and inspired cooperation. He brought together a multi-disciplinary team together in one place, and created what became the first Brain Balance center. 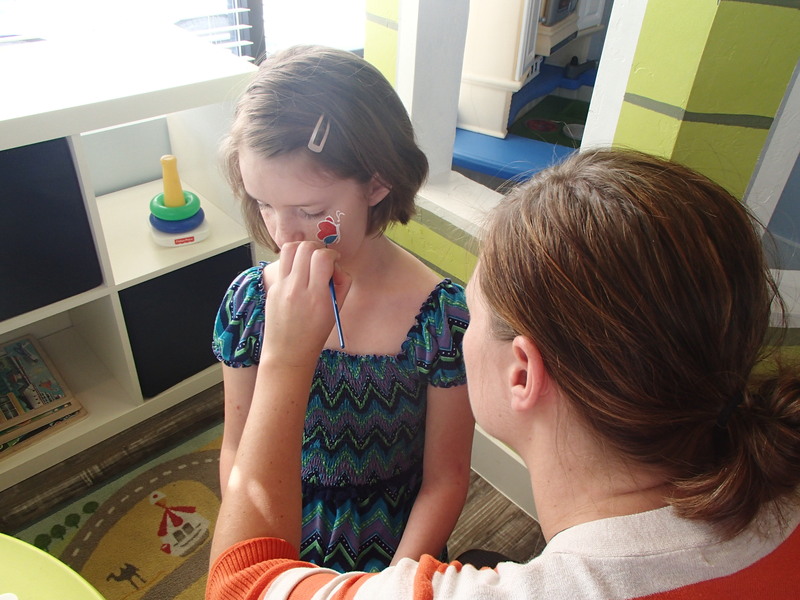 One of the most respected specialists in childhood neurological disorders in America, Dr. Robert Melillo has been helping children overcome learning disabilities for over 20 years. His areas of expertise include: autism spectrum disorders, PDD/NOS, ADD/ADHD, OCD, dyslexia, Asperger’s, Tourette’s, bipolar disorder, and other attention, behavioral and learning disorders. 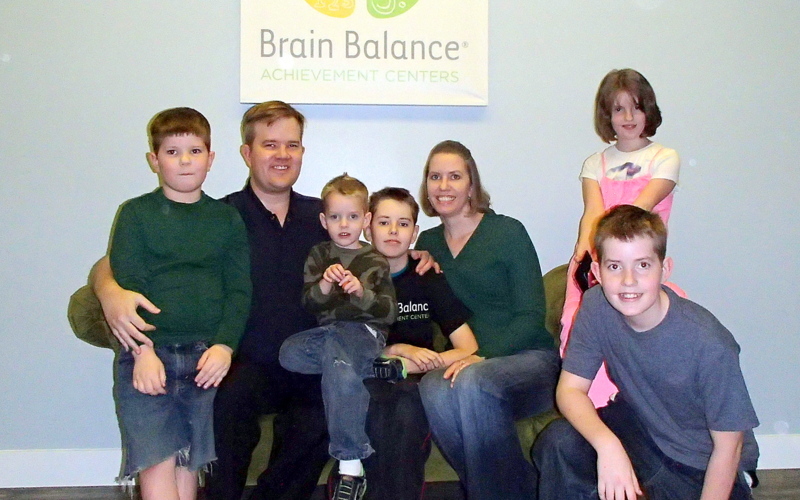 As a clinician for 25 years, a university professor, brain researcher and bestselling author, his cutting-edge research and success with over a thousand children in his private program are what led to the creation of Brain Balance Achievement Centers. 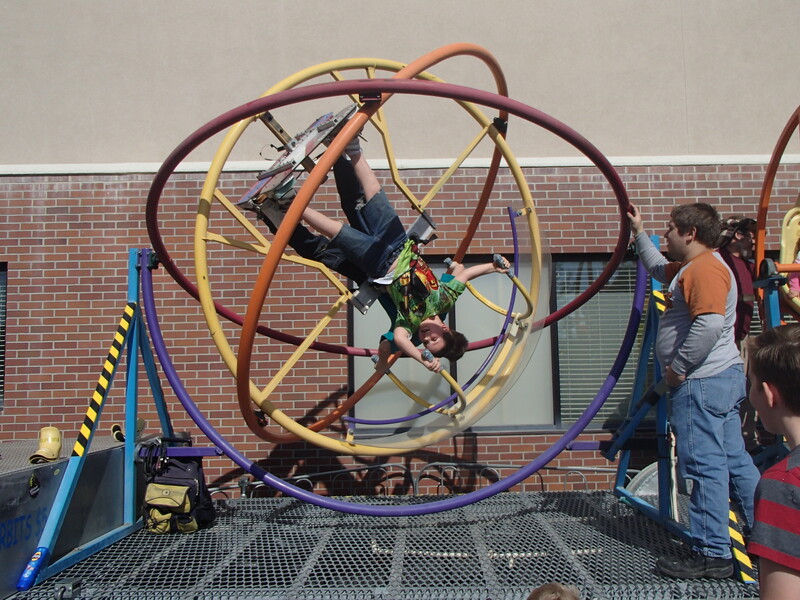 Brain Balance Centers are cutting edge supplemental learning centers catering only to children with various learning disabilities. 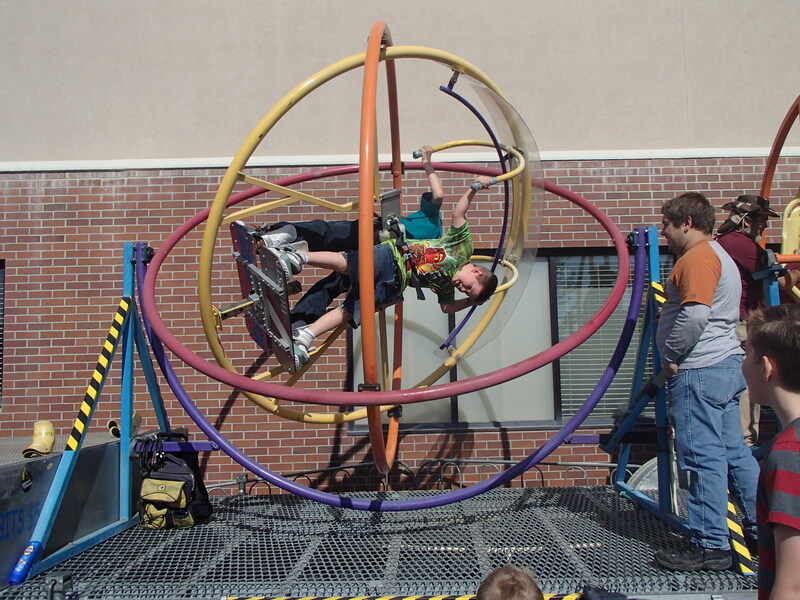 Brain Balance Centers use a multi-modal, hemispheric curriculum focused on addressing the primary issue in most learning disabilities and behavioral disorders which is known as a functional disconnection. Dr Melillo and his research partner Dr Gerry Leisman are considered two of the world’s leading experts and pioneers in the area of functional disconnection and its relationship to neurobehavioral disorders. Since they introduced this concept, functional disconnection has become one the leading theories in the world related to Autism, ADHD, Dyslexia and more. 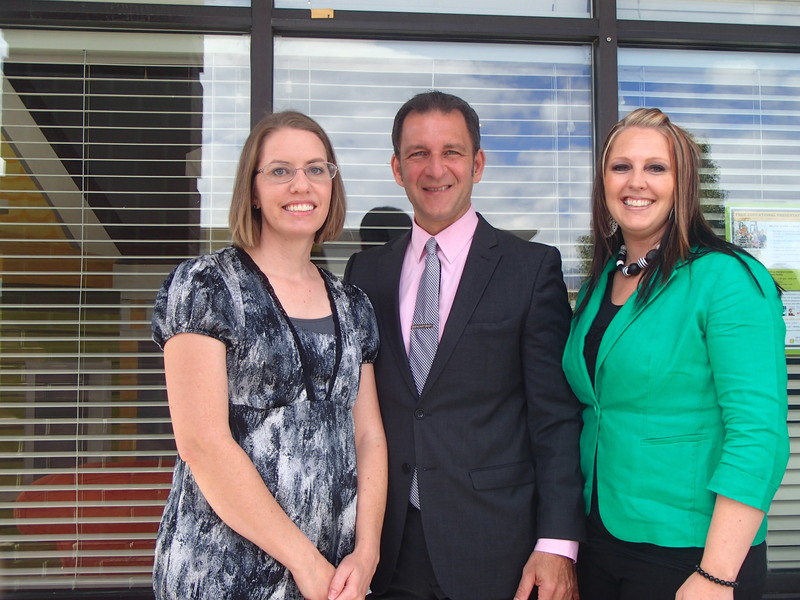 Their work is leading the way toward understanding the underlying nature of these disorders and their causes. 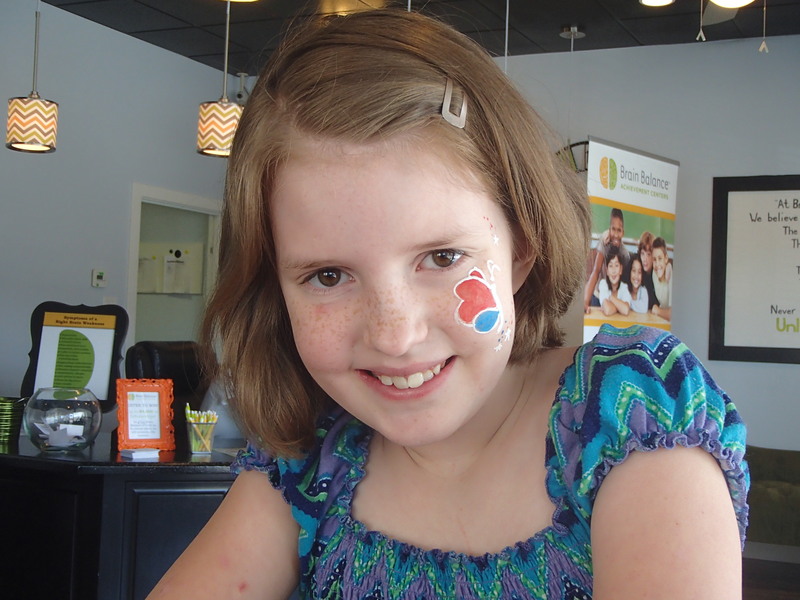 Their lab is focused on developing effective treatments for these and other disorders. 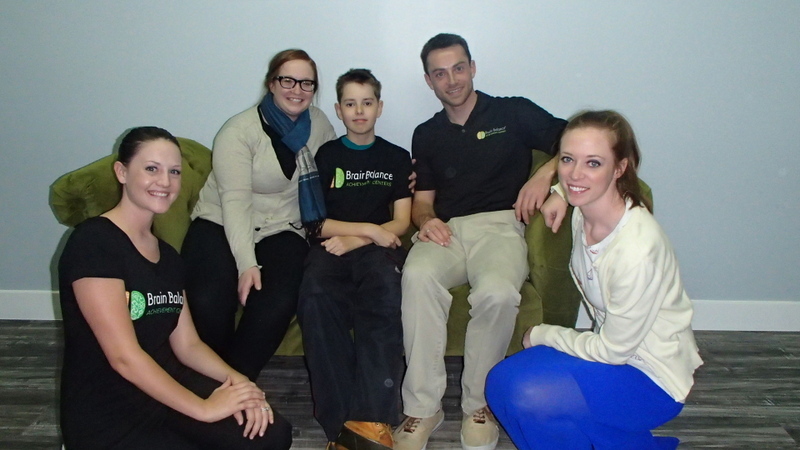 At this point we can’t foresee all of the positive effects that this experience at Brain Balance will have on have on the future functioning of our boys. But we have seen enough to feel a renewed hope for their lives moving forward. Both Dash and Big B had huge issues with ADHD three months ago, but I have seen their symptoms drastically diminish as they’ve participated in this program. I was just delighted to be able to meet this good man in person, and to hear about the trail he [and his research partner, Dr. Leisman have] blazed. I can only conclude that he was the right person, in the right place, and at the right time, to bring the professionals together to help him create this life-changing program. 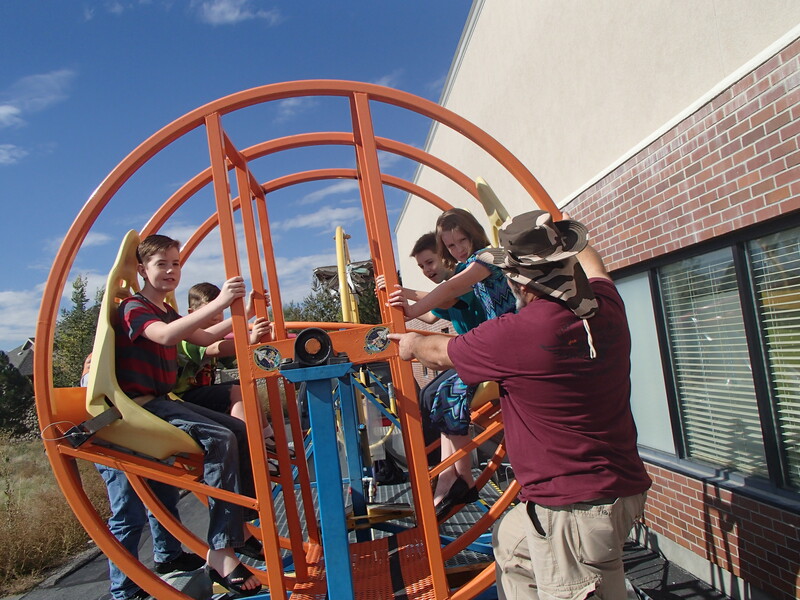 Here are a few more pictures from the Grand Opening party on Thursday, October 17, 2013. All of our kids had a great time. 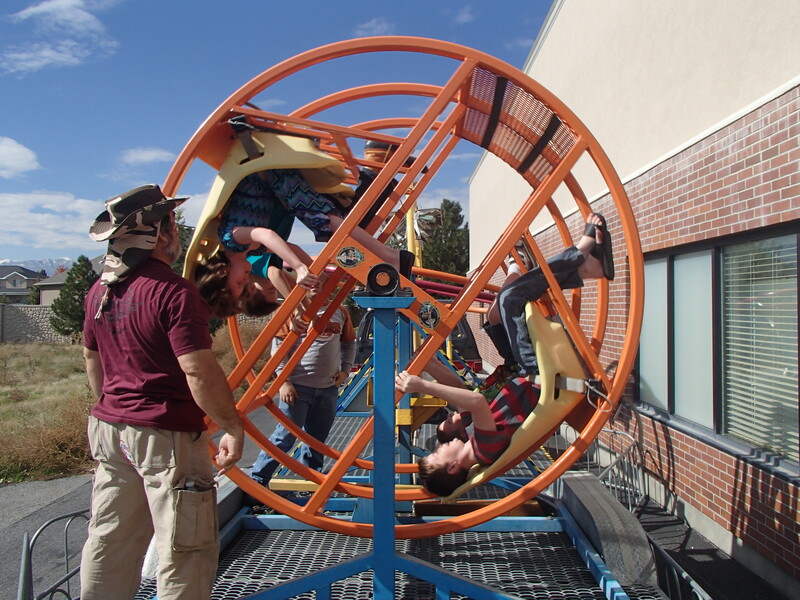 Dash and Big B didn’t want to get off the rides, they were just too fun. 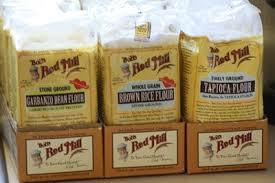 Just real quick, this is an amazing blog post from the Gluten-free Goddess on how to create a good flour substitute for most baking. I have been experimenting on my own, but this post right here has just saved me a bunch of trial and error. I hope it is helpful to someone else, too.